Com o naipe de musicos listado a orquestra não deveria se chamar “grande” mas sim “maxi”. 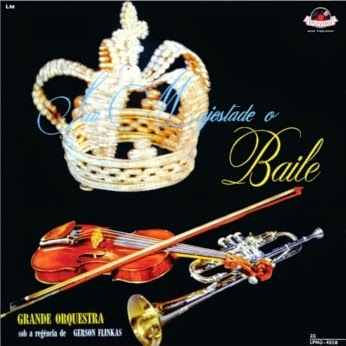 Belissimas orquestração, regencia e repertorio. Parabens pela postagem!!! e que venha mais como esta…. You're right – Noites de Moscou are penned by Vassily Solovyov-Sedoy, not by Issac Dunayevsky. Some words about other musicians. Tito Romero – in reality is special Polydor's name for “João Adelino Leal Brito “, AKA “Britinho” (CBS, Columbia, Odeon, Sinter)/ “Leal Brito, Al Brito / Pierre Kolmann” (Musidisc) and “Franca Villa” (Sinter).Can the pianoman from another Gerson's LP “El Romeu” be Leal Brito too? Or it is Romeu Fossati (Mocambo)? Who knows? Vibrafone player Jota Cláudio may be José Cláudio das Neves? About Vassily Solovyov-Sedoy I found out thanks to one of your previous comments. Speaking about Britinho, stay tuned as in a short time Marshall Tito Romero will appear out of the blue, straight into this reality, together with additional facts about him.